If you have successfully set up your online store you can start selling your goods right away with offline invoices. However, if you believe that your store will generate over 1000 EUR revenue per month, we highly recommend adding bank links or credit card payment opportunities. How to add bank links to my online store? The easiest way to add bank links is to use the MakeCommerce (Baltics, Finland, worldwide) integration that is already built in to our system. Make sure that you are familiar with their prices and sign-up requirements. After that just fill out the new merchant sign-up form on their website. 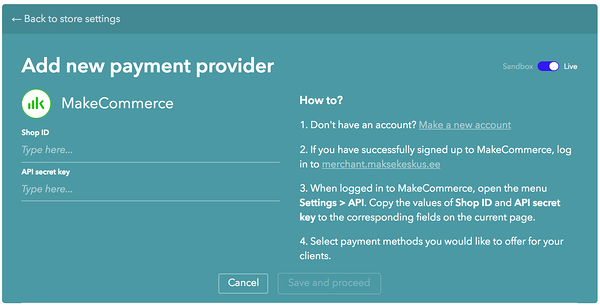 If you have successfully signed up to MakeCommerce, log in to merchant.maksekeskus.ee. In the self-service environment you must open the menu Settings -> API. From there you will find the neccessary information for adding the bank links to your online store: Shop ID and Secret key. If you've found the information, log into your Voog account and go to Settings > Store Settings menu and find the 'Payments' tab. Click on the 'Add payment provider' button. The option for adding both MakeCommerce and PayPal payment methods will appear. 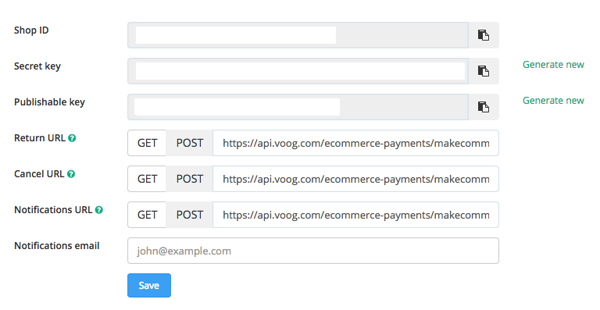 Select the 'Add' button for MakeCommerce and paste the Shop ID and API Secret Key to the fields to the left. Save and proceed. After that you can select which payment methods to activate for your customers. How do I add PayPal to my online store? PayPal is a secure way to accept payments worldwide via credit card and PayPal. Your online store customer doesn't need the PayPal account herself. First thing to to is to read PayPal terms and conditions, see the pricing and create yourself a PayPal merchant account. Log into your Voog account and go to Settings > Store Settings menu. 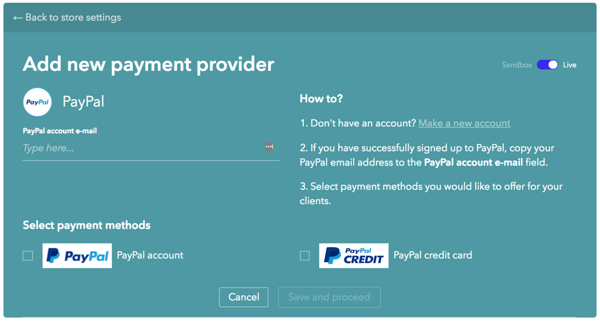 Add a new payment provider, select PayPal and insert your PayPal account e-mail to the designated field. After that you can select the payment methods which will be made available for your customers. Save and proceed!